Talk about a blurb-jolt. THAT is what I’m talking about when I want to be enticed to read something. Short and sweet (er… not so sweet, in this case) but totally loaded in thrill-potential, and doesn’t really tell me anything other than… OMG I HAVE to find out what this means!!! I’ve have had it floating constantly HIGH on my TBR list since. Did I read it? Nope. I haven’t but I’m TOTALLY going to. And when I saw it for rent on Vudu today (I had NO clue this was a movie!!!!). I hemmed and hawed over whether I should go there or not. Go there? Yep. 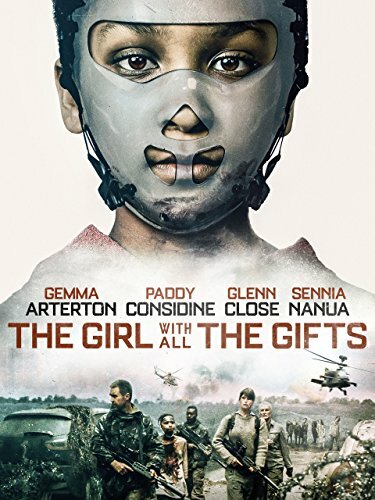 Watch the movie (The Girl With All the Gifts) BEFORE reading the book? ‘Cause we all know books are always better, but it looked SOOOOOOO good and I was totally in the mood for an intelligent zombie thriller such as this. I’ve been craving a good “horror” or at least something seriously creepy and mind-twisty. Movie or book, I didn’t care, as long as it was something that would make me think, and give me a case of the good ol’ heebie-jeebies. This did it. Did I love the movie? HECK YES. Do I think the book would have been even better. HECK YES!!!!!! Especially since my book-twin DID read it and loved it! Amy: Oooooh guys, The Girl With All the Gifts was good. Messed up, but good. …different. GOOD different. You’ll really want some people to get their comeuppance, trust me. Let me know what you think of it! Marit: I just read The Girl With All The Gifts by M.R Carey. Great book A total page turner! And it’s different. It melted my heart ❤️ I know that many of you in here have read it too. Sam: I highly recommend TheGirl With All the Gifts by MR Carey! It was such an interesting POV! Holy moly this was awesome. The premise, the uniqueness, the “reasoning”, and that ending. OH. WOW. I bet the book was EVER better! It’s a post apocalyptic zombie movie, but with a different level of zombie (and a TON of emotion to it). We’re introduced to a military base that has a group of children (I’d say approximately 10 years old) that they are both studying (or should I say, experimenting on… individually) AND teaching as if they were in a normal classroom. Well… “normal” if you consider each child being strapped from head-to-toe into a wheel chair… “normal”. Sweet, interested, adorable children that just want to learn, have stories read to them, to love, and to be loved. The main character (Melanie – one of the “children”) and the teacher of this particular group form a beautiful bond, and it absolutely broke my heart while at the same time, gave me such hope. I WAS HOOKED!!!!! Except no matter what they look like, and how sweet and child-like they are, humans are NOT to get too close to them. Just our scent alone, too close to their faces, will trigger a terrifying reaction, and remind you that these are NOT human children. At least not fully. These are scenes you will NEVER forget. And once you see this (or read it), you will be dying to know the reasoning behind their being. And what a reveal it is! I won’t say another word about it, as I was guessing the whole way through, until it finally became known, and I LOVED it. It made… sense. The only part I didn’t thrill over was a particular scene in the last quarter that was a bit over the top for me. Kind of turned a totally thrilling horror movie into a more… YA dystopian feel, and while those are all the rage and plenty will LOVE it even more because of it, it lost a bit of luster for me. I’m more into post-apocalyptic disasters (and the fallouts and recovery stories), than I am into dystopian. But the two certainly merge well together, and this one proves it.